An anti-drug rally organized by Apex Club Bangladesh was held in Sylhet aiming to spread the awareness message against drugs among the people. Foreign Minister Dr AK Abdul Momen was present as chief guest at the closing ceremony of this anti-drug rally programme. 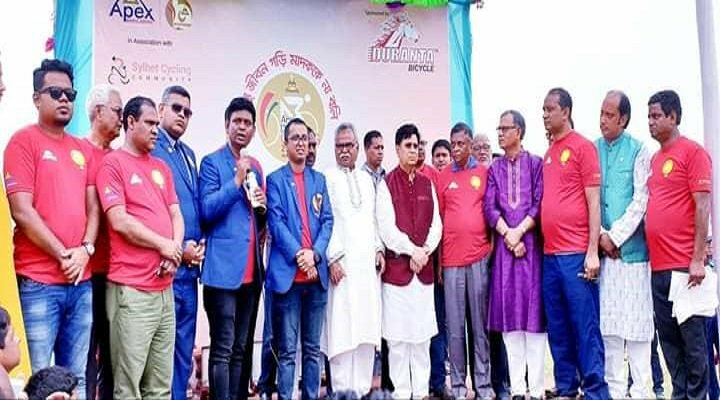 National President of Apex Clubs of Bangladesh MA Kaium Chowdhury,national youth and citizenship director Saim Tipu, national International relations director AFM Enamul Haque Mamun, programme coordinator Ezaz Mahmud Rony, and and many others were also present on the occassion. Speaking on the ocassion, foreign minister AK Abdul Momen said that the government is now on zero tolerance stance against drugs. But, government’s lone effort is not enough to combat against drugs. Awareness of people can help reducing use of drugs, he said. Leaders of the club at the programme said that Apex Clubs of Bangladesh has been working to create a drug free society since its inception. In 1931, three Australian donors established Apex and its Bangladesh wing is working in the country since 1961 for the betterment of society. Apex Bangladesh is working in Bangladesh through 127 clubs in nine regions where around 3,000 active members are involved. Duranta Bicycle is the sponsor of the rally. English daily ‘Daily Sun’ and Bengali daily ‘Kaler Kantho’, private tv channel News24 and Jagonews are the media partners of the rally.